Swedish crime novelist Bodil Mårtensson made an unusual book signing on Thursday June 30, when she signed 75 books in 30 minutes. Although fast, that might not be as unusual as the place where the signing took place – onboard an airplane at 16.000 ft. The passengers on the Kullaflyg flight, departing at 09:45 from Helsingborg Ängelholm Airport towards Bromma Stockholm, got a little surprise after take-off when Bodil grabbed the microphone to tell them about her new book. 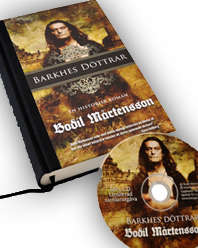 An historical suspense novel named Barkhes Döttrar (Daughters of Barkhe) set in 1656, a time when Helsingborg and other parts of Southern Sweden still belonged to Denmark. – It is an exciting time to write about, the history of Helsingborg is quite a mystery in many ways. And as you all know in 1658 Helsingborg and Scania became a part of Sweden, Bodil told the passengers. The Publisher, Dahlgrens Förlag, are not sure if it is the first time that there has been a official book signing in an airplane but it might be. After leaving the microphone Bodil signed a copy of the book for each of the passengers in time for landing in Stockholm, the Capital of Sweden. The book is only available in Swedish at the moment, but we hope that it will be out in other languages as well in the future. This entry was posted in Uncategorized and tagged bodil mårtensson, denmark, helsingborg, sweden. Bookmark the permalink.